Any of these issues, taken individually, can cause serious long-term damage to a tree and the surrounding landscape. If you have a tree with multiple issues mentioned above, it’s probably time to call in a specialist to assess the situation. All of our certified arborists at Lewis Tree Service have years of experience dealing with the myriad issues that can negatively affect tree health, which is invaluable if you need an accurate assessment of potential issues. It’s important to note that, in some cases (especially decay and root rot), you may not be able to tell visually if there is a hazard that needs addressing. In these cases, it is especially helpful to have the guidance of a trained professional to determine the cause of the issue and offer possible solutions. 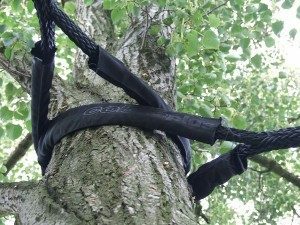 Need an explanation of what goes into a tree support system? This resource has some good general information about the topic, as well as specific tips and tactics for preparing trees to deal with a storm or windy conditions. A tree support system can take on many different forms, depending on the needs and severity of the issue. If a tree just has a slight lean to its foundation, something as simple as staking or bracing it will often do the trick, providing its not indicative of a larger issue. In other circumstances, a more aggressive approach may be called for, such as cabling, guying or the installation of steel supports. Have a tree that could use some support? Call us today at (831) 508-8995 to learn about the options we have available in Santa Cruz and Monterey! We are happy to answer your questions and we offer FREE price estimates that require no obligation on your part!